I was not impressed by Gucci’s Guilty advertisements. They made the fragrance seem like it was catering to adolescent interests. It falls into all the regular olfactory categories ubiquitous today: floral, fruity, sweet… It wouldn’t be worth a mention, but its subtle, yet tenacious and well-developed scent lend it a winning edge. Guilty starts out as a sweet floral, but loosens its sugariness considerably. The pink pepper top note lends a rosy tone to the composition. Peach gives it a skin-like feel. Lilac lends it a clean, floral, very feminine appeal and a soapy quality. Patchouli in the base notes lends it a slightly sweet, dark egde, but, suffocated by florals, it’s magic is lost. Despite how well blended this fragrance is, the high-pitched florals humming over the lost patchouli conjures grandmotherly associations, but that is only my perception. Overall, Guilty is a smooth perfume that lasts about 5 hours – amazing for such a subtle scent. It radiates within about 15 centimetres. 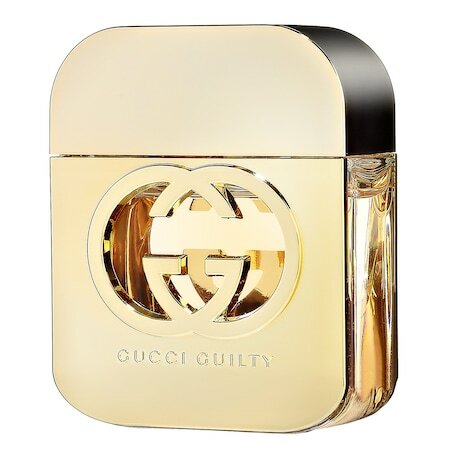 I applaud the quality of Guilty, but personal tastes crave a more brooding, deeper, or layered scent. If you are looking for a modern fruity floral with a twist, however, do try it. My first sniff of L’Heure Bleue made me wonder what was so special about it. I wore it anyway to see how my perception changed. Generally, even if I like a perfume at first, on my third day of testing I am bored and sick of it. L’Heure Bleue however, on its third day, seemed to me like a masterpiece. I may not be an expert, but I see quality. L’Heure Bleue is a grand quality fragrance. What I smelled on day one was the same as day two and three, but my understanding of it changed. It smelled sparkling, yet substantial. L’Heure Bleue is a warm, spicy, powdery floral fragrance with a woody base. The anisic topnotes sparkle into spicy heliotrope and carnation, followed by a decadent base of iris and vanilla. A perfume for the winter and autumn nights, for a grand ball, or a decadent festivity. It lasts about 10 hours, trails the wearer and is noticeable to people standing nearby (approximately 1 metre). The parfum is luxurious. It melds with the skin. I prefer the slightly ligher eau de parfum versions and will definitely be trying L’Heure Bleue’s in the future. The only caution I think that I should give is that the scent is of a different time, and clashes mightily with today’s fruity floral market. Explorers should be pleased, but it may not appeal to all of the audience. Guerlain L’Heure Bleue Perfume: 30ml bottle for £181.80 @ Escentual.com.